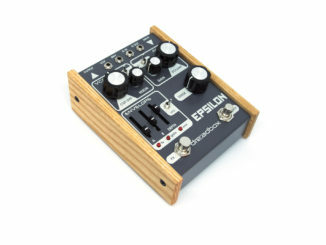 HomeDeals90% OFF AIR Music Tech Vacuum Vintage Synthesizer Crossgrade Sale! 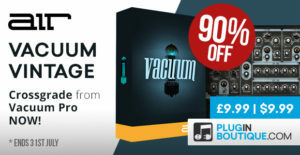 Crossgrade your $1 USD AIR Music Tech Vacuum Pro license to the Vacuum Vintage, a monophonic Synthesizer plugin for PC & Mac with a 90% OFF discount! Plugin Boutique has announced today a sale on the little brother of the AIR Music Tech Vacuum Pro Synthesizer. Vacuum Vintage is a monophonic Synthesizer that was initially released for Pro Tools but now available for other platforms. 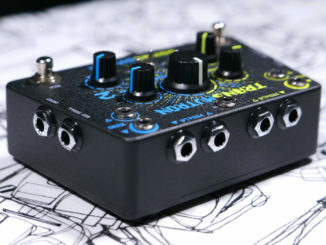 It based on the same Vacuum Tube Synthesis technology and perfect for creating fat sounding bass and lead sounds. For limited time, you can crossgrade from Vacuum Pro, Pro Tools, AIEP 3, AKAI VIP or MPC software with a 90% OFF discount. Vacuum Vintage is a monophonic vintage synthesizer featuring Vacuum Tube Synthesis with vacuum tube circuit modelling that perfectly captures the crunchy, warm sound of the analogue era. With analogue oscillators, multiple filters and envelopes and built-in audio effects, Vacuum lets you dive deep into subtractive synthesis to recreate those sought-after analogue sounds from the 70s and 80s. Tweak the switches, knobs and dials to program anything from basses, leads, pads or unique sound effects. Vacuum gives you two Vacuum Tube Oscillators. A nice touch with the four available wave shapes is that rather than just picking one, Vacuum lets you ‘morph’ between them. The output of the oscillators goes through a mixer, where you can apply drive/distortion and ring modulation, before being passed through high- and low pass filters. The crossgrade offer to the Vacuum Vintage Synthesizer is on sale for £9.99 GBP until August 1st, 2018. Behringer RD-808 Drum Machine Will Get More Features Like Bass Drum Tuning! 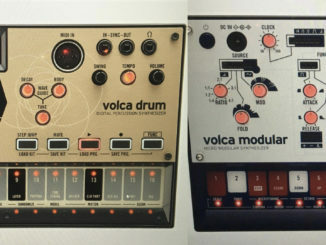 KORG Volca Modular & Volca Drum Synthesizer For The NAMM 2019?